Okay, runners, here we are again looking at a possible snow event that will interfere with our weekly training run. This week is our 18.1/9.1 mile route that includes a loop of Breakheart. sigh. Mother Nature is really invested in getting you super ready, even if getting super ready means rolling with the punches and shifting plans. I am encouraging everyone, that means you, to get your training run in on Saturday and use Sunday as a ‘look at the pretty snowflakes’ rest day. Now, I know running 18.1/9.1 miles on your own, supporting yourself with water/GU, can be quite a challenge. There is a contingent of runners headed up to Plum Island on Saturday morning (caravan leaves at 8:15 from Target Route 1 parking lot – see post from Dave Hayes on the MRC forum). If you can’t run at that time I suggest you post here in hopes of finding company for the mileage and combined effort around waterstop support. This is an important week, but not so important that you put yourself in danger of getting hurt by trying to slip/slide/trudge/sludge through a long run in conditions where your footing is compromised and cars/trucks can’t be trusted. I just noticed that another local Â training run for Sunday was outright cancelled. Â I’m fairly certain some races this weekend will also be cancelled. Barry and Alastair have said they will be available on Sunday morning should anyone show up, but please do what you can do to adjust your plans with a run on Saturday, a run on Monday or a run inside (I know. I just gasped at the thought of 9-18 miles on a dreadmill, but wouldn’t that become a great badge of honor?). Week 7 – What? More Snow? After last weeks snowy challenge, you’d think we might catch a break… we might. 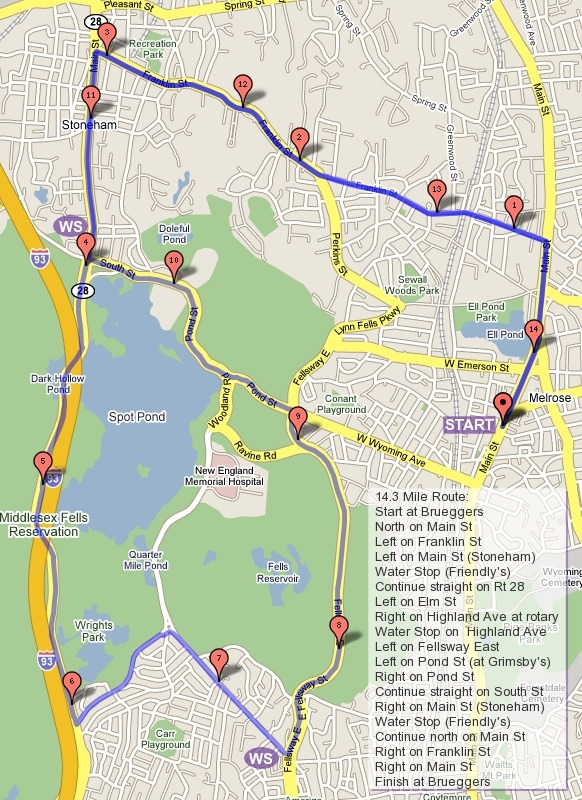 Or we might get a little more snow for our Sunday morning 14.3Mile/7.3Mile run up Franklin Street and around Spot Pond. We’ll keep an eye on the forecast. At least now we’ve had a chance to see how our choice in running shoes, base layers, special socks, and other items hold up in the wintery conditions. So, for the longer distance, Â just an easy run up Main to Franklin, up Franklin to the other Main (Stoneham), a stop at Friendly’s, back side of the pond, to Highland (another spot to take a sip), up the Fellsway, a left on Pond, back to Friendly’s for one more sip, then back to Bruegger’s the way you came. Shorter distance folks head out the same way to the first waterstop at Friendly’s, but then head towards the zoo, take a left onto Pond, a left onto Lynn Fells, down to Main St, right onto Main and a short stretch back to Brueggers. Audrey and Brian W. have the waterstops under control, but please post if you would like to help out. We have a group running the Martha’s Vineyard 20 Miler – GOOD LUCK to all of them! Are you in? ROLL CALL! Snowmageddon… Snowpocalypse… Call it what you want, it still equals 2+ feet of snow to make a challenging run downright epic. Alas, we trudge or sprint or fartlek on. This week we have one of our favorite routes – Winchester Highlands. Please familiarize yourself with the map! Long runners and not-as-long runners, you need to know where you’re going so that you don’t have a ‘now-where-did-she-say-to-turn’ moment on the course. Â I’ll go over the route when we are at Bruegger’s, but I expect you’ll know it by then. Â I suggest we all take extra precautions this week as well. For one, wear the brightest colors you have, reflective gear all the better. We need to be seen. I’ll buy a coffee/tea for the brightest outfit tomorrow, so dress to impress. Two, bring along your cell phone in case of any unexpected mishaps. It might be slippery, there might be hidden potholes, who knows. Be like a Boy Scout, just in case. Three, please defer to motor vehicles. Do not insist on your share of the road. As far as most cars, trucks and snowplows are concerned, they don’t see you as having a share of the road when the space is compromised like this. Run single file when you need to, jump onto the sidewalk to help the effort, just be very wise. I’ll be at water stop Â #1/#3 on Eugene St. and AJ will have his car at water stop #2 at the bottom of Highland. So, who is in for a delightfully hilly and very white run tomorrow? ROLL CALL! This week we’ll be running on Super Bowl Sunday. We were hoping to be sporting Patriot’s gear and running around like wide receivers, but that’s not how things played out. But in the spirit of the Baltimore Ravens, if you have any injuries from all this training take whatever drug you can to get yourself back in the game! Ok, enough sour grapes, on to the run. This week we’ll be making our way out to Breakheart, but this time we’ll be going in the Wakefield side. It’ll be a shorter run than last week, with a few challenging hills in it. We’ll head up Main St, veer right onto Green St, and turn right on to the LynnFells Parkway. A mile or so down the road you’ll come to a set of lights, turn left there onto Main St in Saugus. Follow the hills up and down, Main St will become Farm St when you get into Wakefield, and you’ll come to Wakefield High School on your right. There will be a waterstop in the parking lot waiting for you. From there head up past the Voc and into Breakheart. Go counterclockwise around Breakheart, hills first, then the less hilly side. When you reach the Voc again, pop on out, down the hill back to the waterstop. After the water stop go right on Farm St to the end. At the end turn left on Water St and run along to Wakefield Center. You’ll turn left on Main St here which will take you all the way to Melrose and back to Brueggers. If I get a helper or if you’re not too fast, you might have a bonus water stop helper at Nick’s Pizza by the Dunkin Donuts in Wakefield. If you’re running the shorter route you have an option. You can follow the route mapped out, or you can run the middle, more scenic part of the run. The mapped route starts with the rest of group, turns back Howard St, jumps onto the LynnFells Parkway at Main St and runs the MRC Summer route backwards from there (past the High School to Grimsbys, onto W Wyoming back to Main St). To do the more scenic route you could meet at the parking lot where J Pace’s used to be, on Main St in Saugus by the LynnFells Parkway. From there run to the water stop, loop Breakheart, and then head back to your car. I believe that’s a more challenging 7 mile run. This will be my last week for a while organizing the runs. I’ll be passing the organizational duties over to Barry Petzold, AJ Drummond, and Brian Walfield. Each of them will be running as well as organizing, and there may be weeks none of the three will be available, so please help out as much as you can. This program belongs to all of us, help keep it going. So who’s in for the Last-Jim-Carson-Long-Run-For-a-Long-While? ROLL CALL!